Nostalgia time today!! 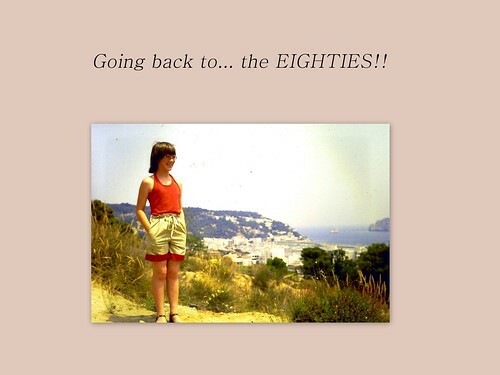 Some time ago we went to the seventies (see this and this post), today it’s all about the good old eighties! Read on for some personal stories accompanied with some hilarious pics! I’ve got a couple of outfits in mind… in 1980 we went to Italy and my mum bought me the loveliest blue outfit overthere!!! I remember feeling very chique and elegant in it… isn’t it just lovely! My mum is looking ab fab as well in her LBD!! Another outfit which is very memorable is the outfit I wore during my Confirmation. At the start of our shopping spree, my mum had shown me this floral outfit, however, I had set my mind on a skirt/blouse/blazer trio as that was so ‘trendy’ at the time. I tried out several skirts/blouses/blazers… but that look just wasn’t me! 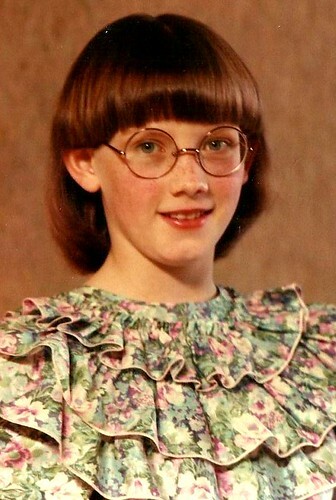 OK, it might look like some old-fashioned wallpaper, but I promise you that it was VERY chic in 1983! And a third outfit was one from the end of the eighties… my favourite whitewashed jeans, an Esprit T-shirt and a black bomber jacket. Loved it and felt so comfy in it 😉 Couldn’t find a picture of the entire outfit though, but believe me… these are the jeans & t-shirt 😀 (although it could be any jeans and white T I guess…). During the eighties, I regularly went to the cinema. As I was in my teens, I just loved the Brat Pack, a group of young actors who appeared in teenage movies like St. Elmo’s Fire, The Outsiders, Pretty in Pink, but my favourite film from the eighties definitely is The Breakfast Club! I even wrote a blogpost about this film, you can read it here! 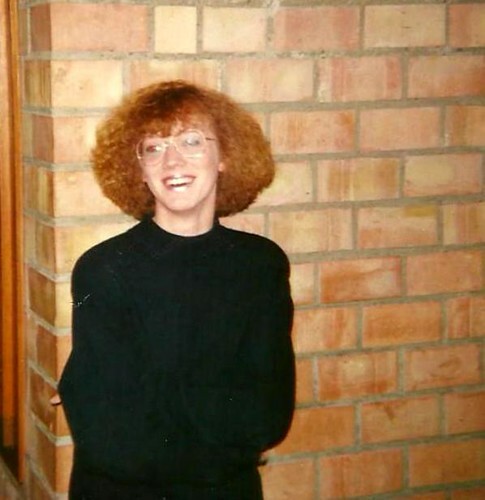 Oh I’ve certainly had the time of my life in the eighties! When I was a kid,I went to the library once a week, renting out 3, 4 books every time! 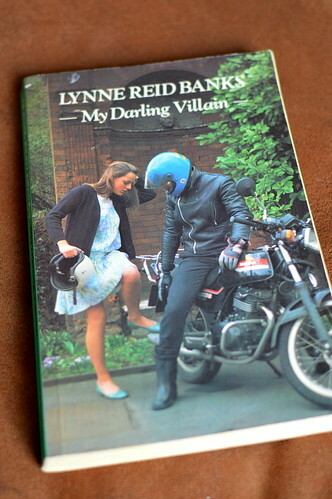 I read a lot and my favourite book from the eighties definitely is ‘My darling villain’ by Lynn Reid Banks. It was a book about a fifteen year old girl from the British middleclass Kate who fell in love with a working glass boy (I forgot his name… wait I’ll look it up… MARK!!! How could I forget 😀 !!!). Such a classic story, but I loved it so much. 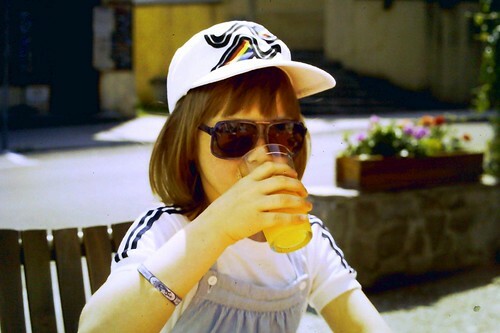 There were a couple of fabulous holidays in the eighties. 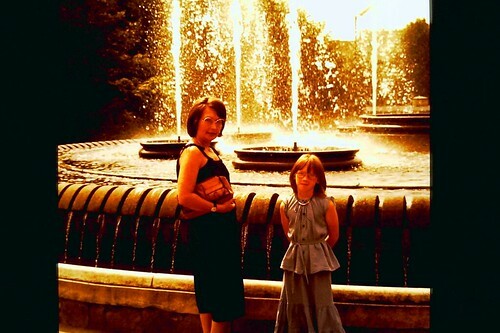 We went to Italy in 1980 (with a memorable visit to Venice and San Marino!) 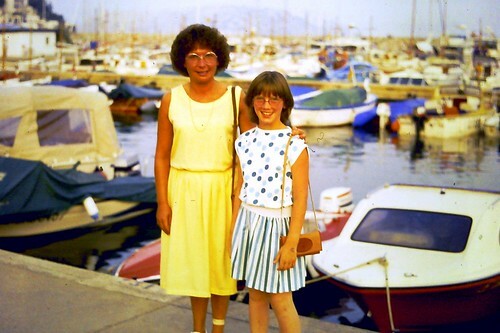 and in 1983 we had a fantastic holiday at the Costa Brava. I love this pic of my mum and I. We both look very stylish 🙂 (apart from that band aid on my mum’s leg!). Another beautiful outfit, this time in Spain! Another holiday I’ve got fond memories of is the trip I had with some classmates in my final year of highschool. The destination (Germany) wasn’t to our liking (we couldn’t choose as it was a schooltrip), but oh my god did we make the most of it… The perfect way to end our highschool days!! 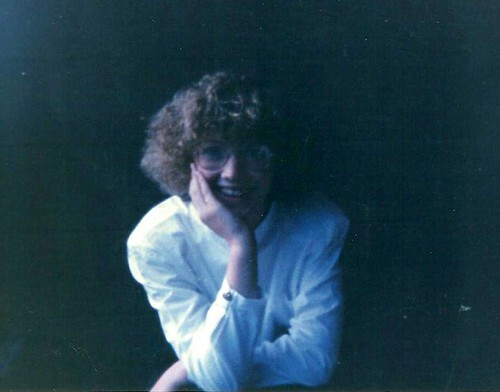 This entry was posted in Lifestyle, Personal, Uncategorized and tagged eighties, nostalgia. Travel: My top of 5 free things to do in Paris! The 80’s is still my favorite decade. Great photos – when you see bands like Poison and A Flock Of Seagulls, all you see is the hair! Yes indeed! By the way, this is no knock on their talent, it was just a VERY specific time for hair, right? hahaha the picture with the big hair love it!!!! I love the photo with the shades and glasses. It looks like someone had a decent camera! My parents took everything on disposables, which ksays more than I’d like about the proof of my documented childhood. My dad was and still is into photography so he took the picture. I’ll tell him you love the pic… will make him grin from ear to ear 🙂 Thanks for your comment Tim! Awe, love this post! It really took me back. I used to love 16 Candles, Molly Ringwald. 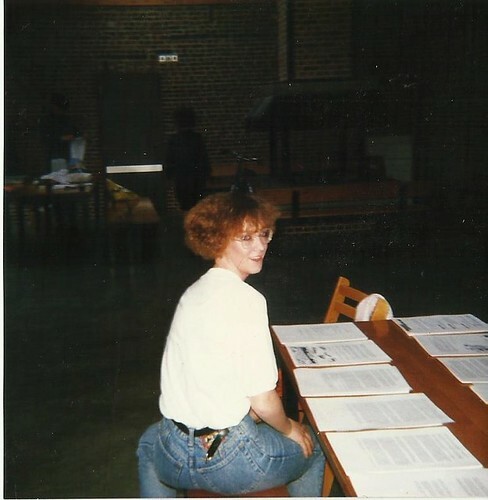 🤣 I also had curly big hair, lol!